Several years ago a horticulturist friend of mine gifted me with a paw-paw fruit to taste. It had been grown by another friend of his and he thought I’d appreciate giving it a try. I liked the taste and was impressed with the large, beanlike seeds. Since I’m always trying to grow random things, I potted up the seeds in some number one nursery containers I had sitting around and waited to see what happened. If I remember correctly–this was eight or ten years ago–they actually took over a year to send shoots up. When they were a couple feet tall or so I planted them along the west fence in the back garden which was the brightest spot at the time but still shady. Those are the conditions paw-paws like. Fast forward to the spring? of 2017 when I was looking at the garden and noticed something weird on the largest of the trees. When I got closer I could see it was the pendulous maroon cup of a flower. Closer inspection revealed that there were several more on the tree. It was finally blooming! As luck would have it, our next-door neighbor also has paw-paw trees and when I told them we had blooms, he suggested we cross-pollinate them since they are supposed to not be strongly self-fertile. We traded pollen back and forth between our trees several times as more flowers became receptive and I tagged mine with the dates. The flowers were also being visited by what may have been small flies. The flowers are not sweetly scented but are rather more carrion-ish. Not all took and some that started forming small fruits failed and fell off. In the end there were two that looked promising hanging just above head height. Paw-paws fall off the tree when they’re ripe and ready to eat so I rigged mesh bags below them to keep them from just becoming squirrel and chipmunk chow. I think that would have worked, but somehow one of the little buggers managed to chew a fruit through the mesh and ruin one end of it. Not wanting to lose them completely, I picked them a little early and cut them open after trimming off the damaged bit. The flesh was soft and sweet-smelling, though maybe not as much as if I had been able to leave them on the tree longer. If you haven’t tasted paw-paw you should if you ever get the chance. It’s the most northern growing of the members of the custard apple family and definitely has a tropical flavor sort of akin to banana or mango but unique. Now that I had some, what to do with them? Two of our best besties were in town that weekend and we were going to dinner at their place so I offered to take care of the cocktail course. I found a recipe online for something called a Paw-Paw Rum Runner that called for both fruit-infused rum and puréed flesh. They were good, but I think the rum overpowered the flavor of the fruit. Additionally, I felt like I was wasting some of it in making the infused rum. That bit of fruit became inedible and didn’t really impart much flavor to the booze. Just as before, those many years ago, I saved the seeds from both fruits and potted them up in my homemade compost. There are now seventeen pots sitting in my propagation area waiting to possibly, slowly, eventually bring this tropical-flavored native fruit to the gardens of my friends and neighbors. Today I whipped up a batch of something I wouldn’t have even considered until recently. You see, all my life I’ve believed I have an allergy to bananas. It’s never been a problem since they’re pretty easy to avoid and I don’t even care too much for the smell of them. That all changed on our trip last February to Costa Rica. At the last place we stayed, we were served a sweet, red spread with breakfast that I thought was delicious. 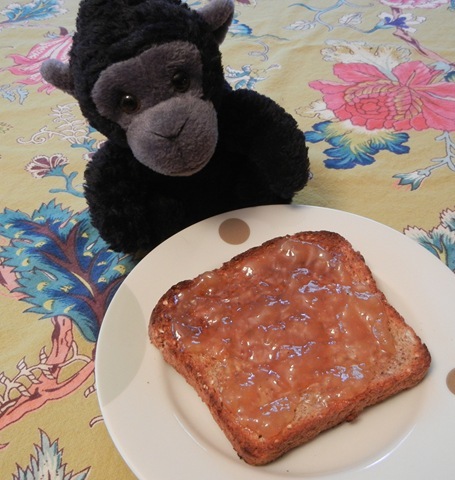 It turned out to be Banana Marmalade! I’ve never had a problem with the flavor of baked foods like banana bread or cookies so maybe it’s just raw bananas that turn me off. And I’m pretty sure if I ever was allergic I’m not now. In any case, I asked the lodge owner how it was made and she gave me a quick description but no set measurements. Today I just googled for a recipe and used one that appeared several times in the first page of results. 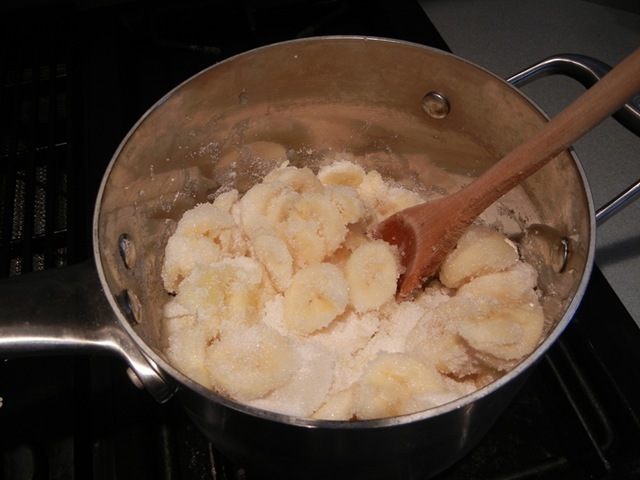 I started with a pound and a half of bananas and a lemon. The recipe also called for the zest of half an orange but since I didn’t have any I used the dried stuff from Penzey’s. And, of course, there’s lots of sugar. Everything just gets dumped in a pot and cooked. I was skeptical at first that there was enough liquid. Having never eaten a raw banana, I always just assumed they were as dry and spongy as they looked. Once they got cooking I was surprised at the amount of juice that came out. 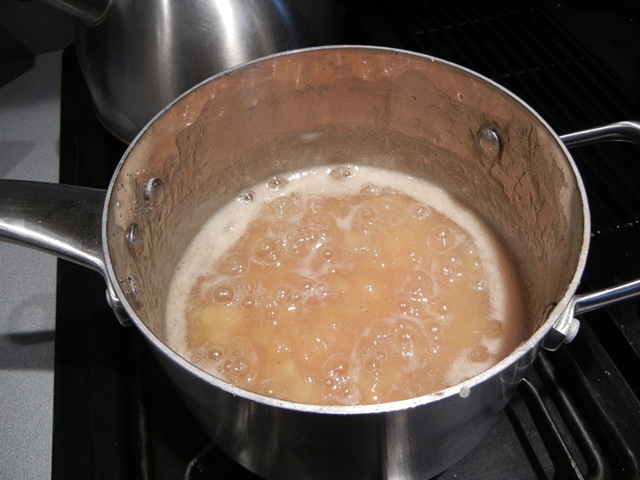 I kept stirring and cooking them on medium-low heat and watched as the fruit broke down and the mixture got thicker. Eventually the marmalade took on a translucent sheen and a spoonful on a chilled plate had the right consistency after a quick visit to the fridge. 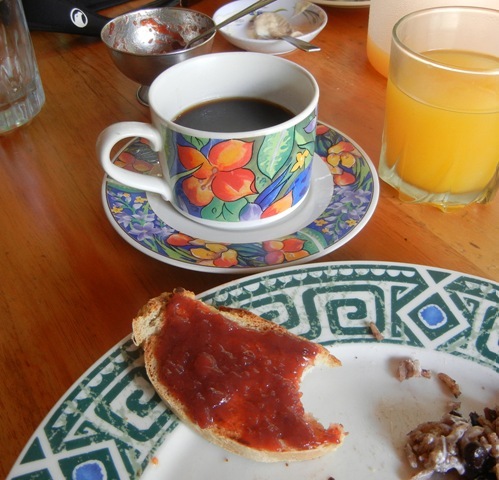 You’ll notice, if you’re as attentive as I think you are, that it doesn’t have the pretty red color that the Costa Rican marmalade had. The lodge hostess told me there were no red ingredients and that the color was just from the caramelization of the sugars. 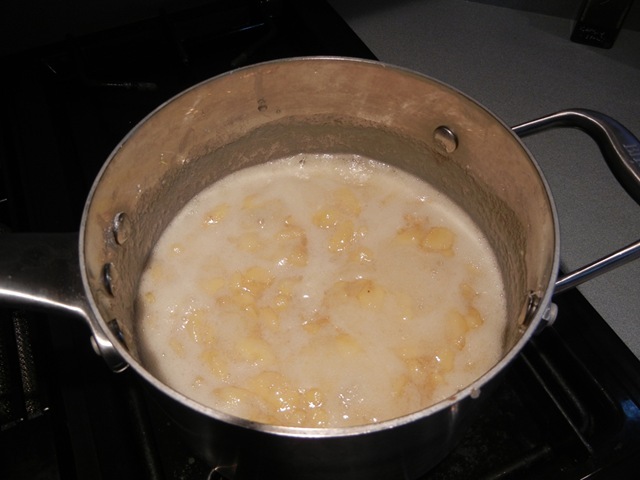 Since my batch was getting thick I was hesitant to push it any farther and end up with a scorched flavor. Maybe next time I’ll be more daring. 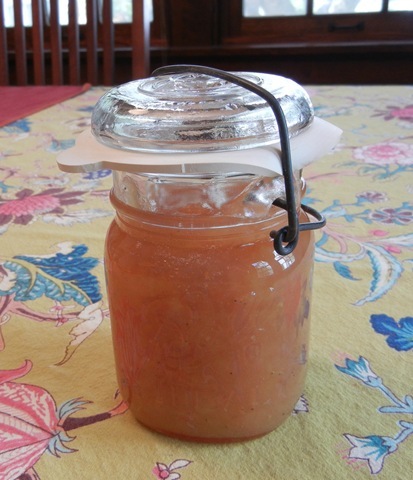 I jarred it up and left it to cool before the final tasting. Since it was going in the refrigerator to be eaten right away I didn’t bother with a full-on processing, although the second jar did go in the freezer. Hopefully it’s sugary enough to not expand and break the jar. Once it had cooled some, I tried it on a piece of toast. Pretty yummy but doesn’t hold a candle to local strawberry jam. Since my strawberry plants are only blooming right now, I don’t think I’ll be jamming any too soon. But this tropical treat might hold us over until the local fruit comes in. My only concern is about the kinds of wildlife it attracts.